I’ve waited a LONG time to be able to say that! Tomorrow is the day! Now, I should say, this is barring any significant issues between now and then, but we are believing that there will be NONE! Today has been a WHIRLWIND! Trying to pack up our room, finalizing our CPR instructions, Med instructions, getting a BILLION prescriptions filled, getting Oxygen delivered (more will come to our house next week… so NO LIGHTING FIRES around house, kay?!? *grin*), getting our feed pump and supplies delivered, and getting trained on USING all this stuff! Going home for Annabelle is NOT an easy task. But it is well worth it, let me tell you! I ordered my lunch about 2 hours ago… and have yet to eat it, to tell you how crazy it’s been! Cardiologist had a long discussion in the weekly “heart meeting” with ALL the cardiologists and the heart surgeon. This is where some not so great and a little scary news comes in. So, we are coming home now because a.) we are a stable family and since we’ve been so involved in her care, they trust us, and b.) we only live 40 minutes away vs. hours away like many families. Otherwise, we’d be staying. But they are still VERY concerned about her, as she has a moderate to severe leaky valve in her heart. The fear is that the leak is making blood back up into her lungs, this creating high pressures, which prevents us from having our Glenn. What the surgeon WANTED to do was try to wait until Spring, hoping that she would grow bigger, and the pressures would decrease. But her heart is having serious issues functioning well with such a large leak. Her liver is distended, which is a very bad sign, and not to mention we are still having occasional fevers and bloody stool. Still, they feel comfortable enough for us to go home for a while. It might only be a week. It might be a month. But at the moment, the feeling is that soon she will have to come back in and have yet ANOTHER heart surgery to fix her leaky valve sometime in January. And this still, probably, will NOT be her Glenn. That depends greatly upon the pressures in her heart. They would do the leaky valve fix now… but the surgeon wants her to grow a little bit, as her heart tissue is VERY delicate, and as she grows, it toughens it up, making it better tissue to stitch up I guess. I know this is all complicated… and probably too much information… but long story short, we are going home, but we have NO idea for how long. And now we have 2 heart surgeries to prepare for in the next few months, vs. one. *sigh* That is overwhelming to think about, but I’m not going there right now. I’m just thanking God for our CHRISTMAS MIRACLE!!! PLEASE pray that we have a very UNEVENTFUL weekend! I gotta tell you, they trained Scott and I on CPR, and it scared the crap out of me. Mostly because I know there’s a decent chance we might have to use it on her someday, and knowing she’s had chest compressions at least 4 times in the past to save her life. It made me really stop and grasp the reality of it all. GOD IS AWESOME THOUGH, and has brought us through thus far. We are believing in GOOD things for our Annabelle, and look forward to a happy, family-filled Christmas, celebrating the birth of our WONDERFUL Savior! I can not WAIT to post our coming home pictures for you guys!! Not sure if I’ll have time tomorrow with everything… but I WILL sometime this weekend! –krista…. skipping away to actually EAT my lunch while doing the snoopy happy dance! I'll be praying for you guys, but how EXCITING!!!!!!!!! Can't wait to see pic of her in front of the Christmas tree. Merry Christmas to you all. We will continue to pray for her and you and Scott for strength and wisdom as you care for her at home, no matter how long or short it is. Wooohooo! Krista, I know your mother's heart is thrilled to no end! I pray that God will surround little Annabelle with His angels and that the time at home will be uneventful and a GREAT Christmas for you all. Congrats! This is such wonderful, exciting news! Praying for an uneventful weekend and a wonderful Christmas! I'm so excited for you and praying for a smooth transition for all of you and that she will like the change and not get huffy like she did when you moved out of ICU. I hadn't been to your blog in a long time and unfortunately was not aware of your baby and your situation. I found out through Bowen's Heart blog!! Go figure. So sorry we haven't been connected but believe me, now that I am aware I will be praying for you and your family. Looking at the pictures of the girls, I can't believe they are so big. I remember them as babies! Blessings and Merry Christmas! Wow, wow, wow!!! Praying that little stinker behaves for you. 🙂 Enjoy your Christmas! YAY!!!! This is awesome news and just what you were asking for. 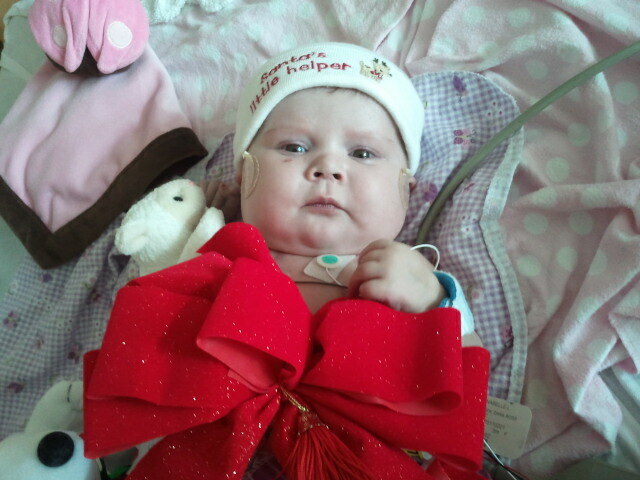 Great to hear that Annabelle will get to come home for Christmas. YAY! What a wonderful Christmas present. My, what a road you have all been on thus far … praying for health and happiness in 2011. Oh my goodness, God is good! God is awesome!! This is such great news! Have a very blessed and wonderful Christmas with your family and I pray everything will go all right and Annabelle can stay for some time. Krista, I am typing this with tears of joy in my eyes and a major case goosebumps covering me. What wonderful news! I'm praying for a smooth transition free of any unexpected bumps in your road and that your Christmas is even more wonderful than you thought possible. Krista, I'm praising God and praying. I'm praising God for answered prayer! Just as He answered this one, He'll answer your other prayers concerning her health. How exciting, Krista! Will keep you guys in prayer. Hi,This is the first time writing on your page. My Son and I hve been praying every night for Annabelle to go home to you for Christmas. GOD Is Good. I will continue to ask for her complete healing. She has a beutiful spirit.T The first pic. I saw was when I was on Bowens page and was reading his prayers. Her picture Stood out. And your heart for the Lord has touched mine. I will lift all of your family to have a blessed Christmas. And healthy new year. May you feel his presence and our prayers. Psalm 91 over you and you'r family. SOOOOOOOOO AWESOME!!!!!!!!!!! I'm so… I don't even have words. I had to try to quiet my squeal and I cried after your entry and I'm sooooo happy for y'all! That is great news. I hope you got her home today! This is so awesome!!!! I am praying for sweet Annabelle and your family! I can't wait to see the pictures! Congratulations! I found your blog through the one for Bowen. Been thinking and praying for you.